The abdominal aorta is the largest artery in the abdominal cavity. As part of the aorta, it is a direct continuation of the descending aorta (of the thorax). 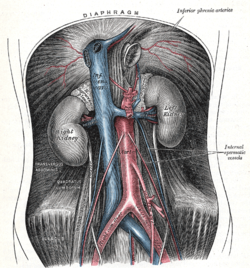 The suprarenal abdominal or paravisceral segment, inferior to the diaphragm but superior to the renal arteries. The Infrarenal segment, inferior to the renal arteries and superior to the iliac bifurcation. inferior phrenic T12 Parietal yes post. Originates above the celiac trunk, below the diaphragm. Passes upward and medially to the suprarenal gland, and crosses crus of diaphragm of corresponding side. Supplies diaphragm and gives superior suprarenal arteries. superior mesenteric L1 Visceral no ant. Large anterior branch, arises just below celiac trunk. middle suprarenal L1 Visceral yes post. Crosses crus of diaphragm laterally on each side; supplies the suprarenal gland. renal In between L1 and L2 Visceral yes post. Arises just below the superior mesenteric artery. Right renal artery passes deep to the inferior vena cava to right kidney; here it divides into branches. Left renal artery passes deep to the left renal vein. Divides in hilum of kidney. Both arteries give inferior suprarenal arteries and ureteral branches. lumbar L1-L4 Parietal yes post. Four on each side that supply the abdominal wall and spinal cord. The fifth pair is the lumbar branches of the iliolumbar arteries. They pass deep to the crura on side of vertebral bodies and pass deep to the psoas major and quadratus lumborum to enter the space between the internal oblique and transversus abdominis muscles. Each artery gives off a small dorsal branch, which gives a spinal branch to the vertebral canal and then continues to supply the muscles of the back. median sacral L4 Parietal no post. Artery arising from the middle of the aorta at its lowest part. Represents the continuation of the primitive dorsal aorta; quite large in animals with tails but smaller in humans. common iliac L4 Terminal yes post. Branches (bifurcations) to supply blood to the lower limbs and the pelvis, ending the abdominal aorta. Note that the bifurcation (union) of the inferior vena cava is at L5 and therefore below that of the bifurcation of the aorta. Volume rendered CT scan of abdominal and pelvic blood vessels. posterior cecal a. – appendicular a. The abdominal aorta lies slightly to the left of the midline of the body. It is covered, anteriorly, by the lesser omentum and stomach, behind which are the branches of the celiac artery and the celiac plexus; below these, by the lienal vein (splenic vein), the pancreas, the left renal vein, the inferior part of the duodenum, the mesentery, and aortic plexus. Posteriorly, it is separated from the lumbar vertebræ and intervertebral fibrocartilages by the anterior longitudinal ligament and left lumbar veins. On the right side it is in relation above with the azygos vein, cisterna chyli, thoracic duct, and the right crus of the diaphragm—the last separating it from the upper part of the inferior vena cava, and from the right celiac ganglion; the inferior vena cava is in contact with the aorta below. On the left side are the left crus of the diaphragm, the left celiac ganglion, the ascending part of the duodenum, and some coils of the small intestine. The abdominal aorta's venous counterpart, the inferior vena cava (IVC), travels parallel to it on its right side. Above the level of the umbilicus, the aorta is somewhat posterior to the IVC, sending the right renal artery travelling behind it. The IVC likewise sends its opposite side counterpart, the left renal vein, crossing in front of the aorta. Below the level of the umbilicus, the situation is generally reversed, with the aorta sending its right common iliac artery to cross its opposite side counterpart (the left common iliac vein) anteriorly. The collateral circulation would be carried on by the anastomoses between the internal thoracic artery and the inferior epigastric artery; by the free communication between the superior and inferior mesenterics, if the ligature were placed between these vessels; or by the anastomosis between the inferior mesenteric artery and the internal pudendal artery, when (as is more common) the point of ligature is below the origin of the inferior mesenteric artery; and possibly by the anastomoses of the lumbar arteries with the branches of the internal iliac artery. The standard aortic measurement on abdominal ultrasonography, such as used for abdominal aortic aneurysms, is between the outer margins of the aortic wall. ^ a b c Lech, Christie; Swaminathan, Anand (November 2017). "Abdominal aortic emergencies". Emergency Medicine Clinics of North America. 35 (4): 847–867. doi:10.1016/j.emc.2017.07.003. PMID 28987432. ^ Jim, Jeffrey; Thompson, Robert W. "Clinical features and diagnosis of abdominal aortic aneurysm". UpToDate. ^ Jang, Timothy (28 August 2017). "Bedside ultrasonography evaluation of abdominal aortic aneurysm—technique". Medscape.